Dry Needling is a treatment used by licensed Physical Therapists with specialized training and certification to treat trigger points in the muscles which are causing pain. Trigger points are hard knots or compressions within a muscle that can cause pain and decreased movement. Solid filament needles are inserted directly into the muscle at a myofascial trigger point. By stimulating the muscle it produces a twitch which, when it relaxes, decreases the pain and inflammation caused by the trigger point. Dry Needling is a tool used as part of a comprehensive treatment plan determined by your Physical Therapist. Dry Needling can reduce pain and increase tolerance for movement and strengthening. This tool is used in conjunction with manual therapy techniques and specialized exercise programs to form an individual plan of care. How we treat dizziness: The Epley maneuver, vestibular programming, visual accommodation and strengthening of hip and leg muscles can often lead to a significant reduction in dizziness and improved balance. Training and proper use of DME equipment can ensure safety for our patients and their families. Dry Needling is only performed by highly specialized, certified Physical Therapists who have gone through extensive training to perform the procedure safely. 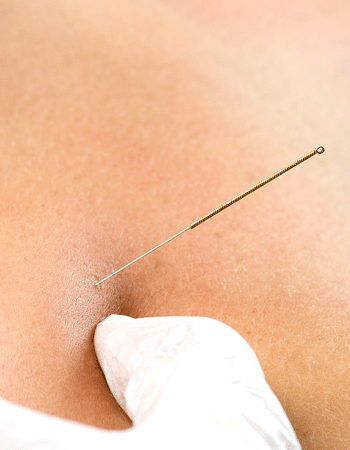 Dry Needling is minimally invasive and should not cause any long-term discomfort. Dry Needling can cause a minimal level of discomfort during or immediately following the procedure, however any pain should quickly subside. Some patients may experience soreness or bruising a few hours after treatment into the next day. Dry Needling is used in conjunction with manual therapy techniques as well as a customized exercise program. The amount of Dry Needling sessions will vary depending on diagnosis and response, however typically 3-6 sessions throughout a treatment plan is common. Shallow insertion of the needle into skin. Needles stay in skin longer. If using Dry Needling as part of a comprehensive treatment plan being billed under insurance, there is no additional cost beyond the insurance patient responsibility for the therapy session. For cash pay Dry Needling sessions, the first appointment is $65 and each additional follow up visit is $50. Dry Needling treatments take approximately 30 minutes each session.